More Resveratrol than in 40 bottles of red wine! JUMPSTART Remember, "What Happens in Vegas"
More ENERGY- Keep your Appetite Away - ADD Natural Solution. "The Energy. . .Beautiful Mind and Body. . .The True HEALTH"
A highest-grade resveratrol super anti-oxidant anti-aging supplement provides defense against free-radical damage, boosts immune function, and provides crucial vitamins for maximum protection against oxidative stress. 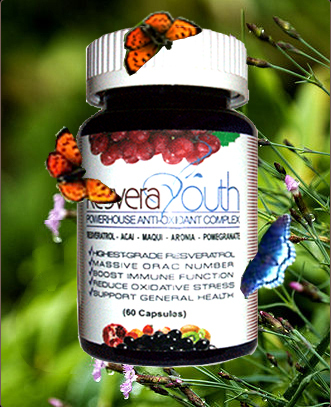 RESVERA YOUTH features 250mg of 99% high-grade trans resveratrol (more resveratrol than in 40 bottles of red wine and more highest-grade resveratrol than other similar anti-aging formulas on the market), and a bevy of antoxidant-rich super berries including acai, pomegranate, aronia, maqui, cupuacu, and borojo, all adding up to a massive ORAC value. It helps activate and restore youthful cellular activity with the proven benefits of so many super-fruits. Our superior antioxidant combination of unique and novel ingredients supports longevity gene activation, promotes immune function and healthy aging, and even helps repair age-related cellular damage, restoring youthful DNA. This amazing formula is scientifically standardized to the highest level of active principle and will benefit your health in many critical ways. Read the full detail page for this product for complete information on the beneficial ingredients. -FREE your Family from Unnecessary INTOXICATION! We strongly suggest Pay pal Orders / or Pay pal Invoices to authorize your *INTERNATIONAL ORDER. INT' Orders-PLEASE, Add *Shipping 6.65 Thank you.